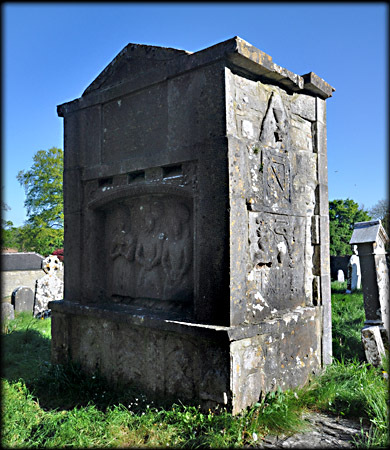 Traditionally, and for obvious reasons, Ardbraccan is associated with St Brecan of Aran, who is believed to have visited the area in the 6th century. The foundation of a church here is attributed to St Ultán in the early 7th century. After the arrival of the anglo-normans Ardbraccan became the seat of the Bishop of Meath. At least five of them were buried here. Standing at the southside of a 14th century church tower is the chest tomb of Rt Rev. George Montgomery. He was a Scottish protestant cleric, who became Bishop of Meath from 1610 to 1620. The reconstructed tomb also bears some slabs from other tombs. 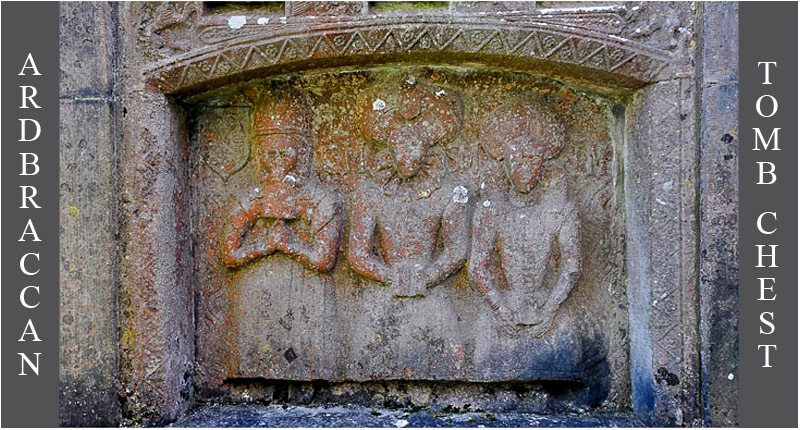 On the northside are three figures, indentified as the Bishop, his first wife Susan Steyning and their daughter Jane. 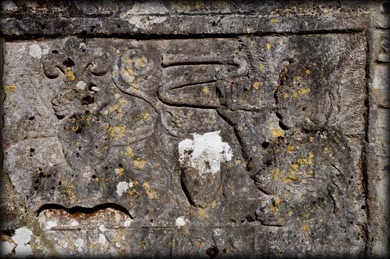 On the west side is a depiction of the Angel Gabriel with a trumpet. 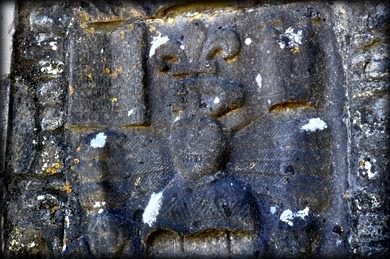 As well as the Montgomery coat of arms, it is suggested that a second coat of arms may be that of the Eglington family who were related to the them. The cover and side-stone from another tomb is lying close to the Montgomery tomb. HERE LIETH THE BODIE OF.../ PETER NOV LATE / DECESSED / THE 21 OF / AVGVST / 1585. To east of the tower is an 18th century church, it was deconsecrated in 1981. 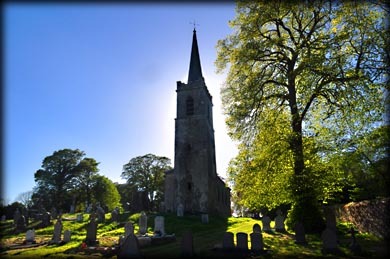 Arbraccan church stands in a well kept graveyard at the end of a quiet Cul-de-sac. I will definitely return and hopefully get some sharper images. Situated: From the Townparks roundabout in Navan head north passed to Lady's Road. After 3 kilometres turn right. The church is 200 metres down here on your left. Discovery Map 42: N 8284 6833. Last visit May 2017.